I notice she’s not got the collar you talked about earlier, is it going to be added on later, or is it not an actual visual element? So, I had an idea about that. 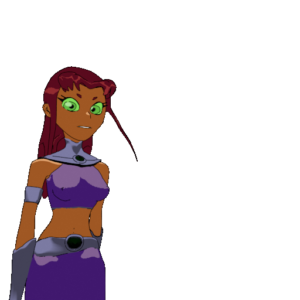 Starfire’s design already incorporates a collar with a big gem on the front. Since this game is set before the Teen Titans, I thought that this could be the origin of this particular adornment. So, the collar Starfire always wears is actually her slave collar, and she keeps it after finally deactivating it as a memento of her escape. In game the gem could be a visual indicator of the collar’s status, showing red while active, blue when inactive.